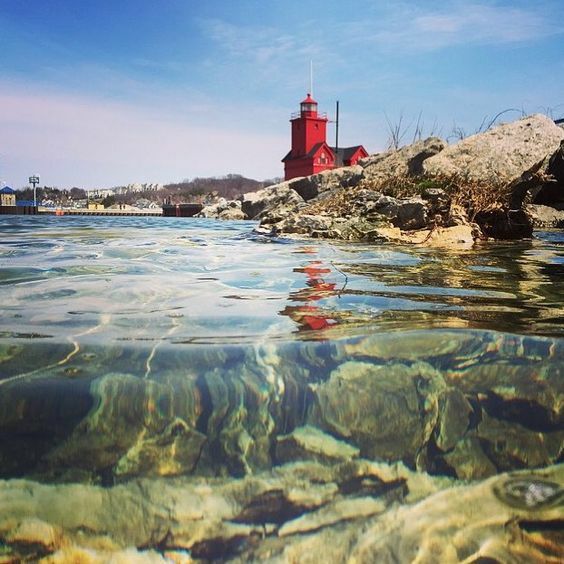 The first lighthouse built at this location was a small, square wooden structure built in 1872. 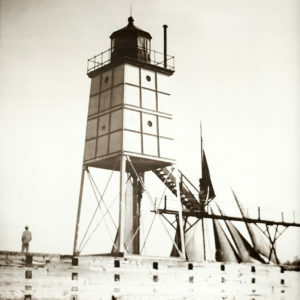 In 1880 the Lighthouse Service installed a new light atop a metal pole in a protective cage. The old lantern was lowered by pulleys for service. 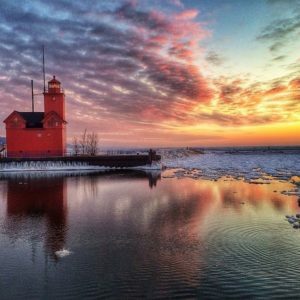 Big Red has stood tall in the Holland Harbor for nearly 100 years. Through rain and shine, through blistering summer days to cool autumn evenings. From the icy austerity of Winter's relentless march as it gives way to the promise of Spring. 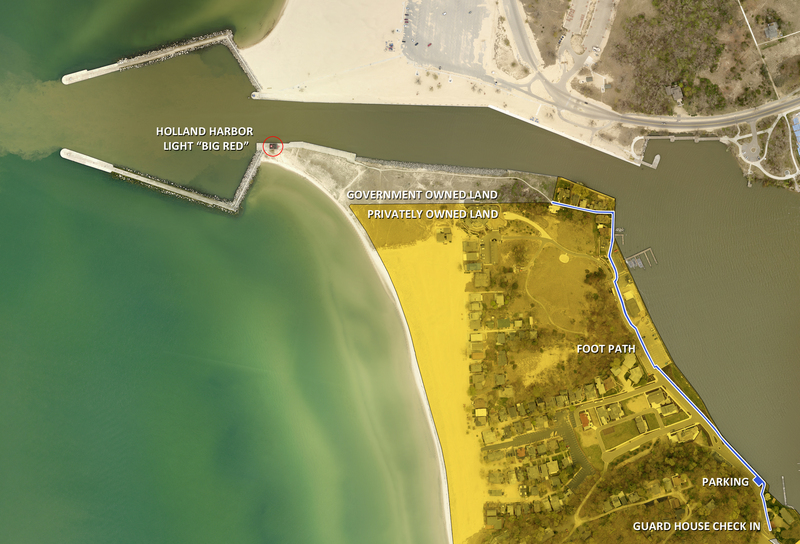 The work of the Holland Historical Commission has enlisted the hours and the dedication of both local and seasonal residents whose love for the majesty and history of this iconic structure spans generations. When planning to visit Big Red, please take into account the fact that private property surrounds the access points to this historical treasure, so a bit of navigation around, and respecting of private property, will help not only ensure your visit is enjoyable but keep the neighbors happy as well..
Out-of-state visitors may visit from 11am to sunset Mondays through Fridays. There is parking for four cars beyond the gatehouse, available when the gatehouse is staffed. Otherwise, parking is outside (not at marina or yacht club). Bicycles must be left in the bike rack at the gatehouse. It is a quarter-mile walk to the lighthouse from the park entrance; the walk is across sand and gravel and is not handicapped-accessible. No beach towels, dogs, or coolers can be carried in to the park. Visitors may stay for one hour. 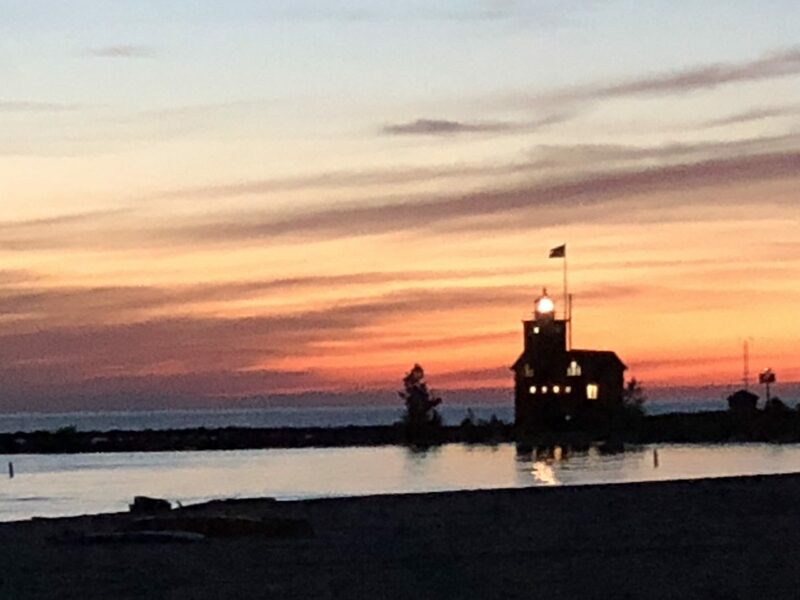 The gatehouse will be staffed weekends during May; this includes the weekends of Tulip Time. There will be an opportunity to park within the gate at that time.